My twin sister and I were about four years old when we wore these costumes made by our mother. An elementary school teacher was lamenting to me about her school's policy of not letting kids wear costumes at school on Halloween. As a child, I looked forward to our school Halloween party and parade every year. My children did as well. It seems a shame that schools are taking a stance to eliminate these traditions. School Halloween Party crafts are part of the fun of Halloween. There are a variety of reasons why schools may chose to ban costumes or parties on Halloween. Costumes could be too scary or inappropriate. Skimpy costumes and hats may not adhere to the school dress code. Some costume props (i.e. fake guns, swords, etc) would violate the school's no-tolerance policy. Costumes and props may be a distraction to learning throughout the day. Too much of the teacher's time would be taken up with helping kids put on makeup and costumes. Not all families celebrate Halloween. Not all kids will be able to bring costumes from home. Costumes can be uncomfortable, or kids may experience anxiety about wearing them. Students may lose or ruin parts of their costume during the school day. I understand the theory behind these concerns. With a little effort though, there are ways to be sensitive to everyone's different traditions, and minimize the negative impact of costumes. Then we could still allow elementary school kids to wear there costumes at school on Halloween. Halloween party activities can be fun and educational. School can sets clear guidelines as to what types of costumes and props are permissible; any child who does not adhere to the rules would not be allowed to wear their costume. Costumes could be stored in a corner of the classroom or a locker, and only brought out at the specified party time, so they are not a distraction while learning is occurring. The teacher perhaps with the help of parent volunteers or the PTO) could have a few simple costume items available for those children unable to bring a costume. Parent volunteers or a class of older students could be recruited to assist a teacher if he /she anticipates being overwhelmed by the task of helping kids put on their costumes. Provide an alternate activity for any child who is not comfortable wearing a costume or participating in Halloween activities. It would be disappointing to see these fun school traditions disappear. I applaud the teacher I was speaking with, for her desire to have her students still experience them. I loved Halloween as a child. I loved it even more as a mother of young children. I loved creating their costumes, and watching them enjoy the parties and trick-or-treating. The first year my kids told me they didn't need my help to make their costumes, I felt sad. I sewed my son's dinosaur costume, but my daughter is wearing a skating outfit my mother made for me, many Halloweens ago! This year I have no young children to dress-up. Because of the rural nature of our neighborhood, it is unlikely we will have any trick-or-treaters come visit. (I bought candy, however, just-in-case!) My daughter is away at college and my son has other plans, so he won't be hosting a party at our house. Halloween just doesn't feel very "halloweeny" this year. Happily though, I have been invited to a “girl's night out” party with friends this evening. Maybe Halloween will be fun for me this year, just in a different way! What are your thoughts about schools should allowing kids to dress-up and have a party on Halloween? How to Decorate a Pumpkin - Without Using a Knife! Yesterday, I started thinking about different ways to decorate our remaining pumpkins. I was tempted to look for ideas on Pinterest, but instead decided to see what I could come up with on my own. I made four very different pumpkins - and I really can't decide which I like best! My four pumpkin creations - - and the culprit that cost my son a trip to the emergency room! I approached this craft project with absolutely no idea of what the finished pumpkins would look like. I have a lot of sewing notions and crafting supplies left over from other projects, and I looked to these for inspiration. It is best to keep an open mind, and let the personality of the pumpkin emerge. Here are some tips. glue, hot glue gun, paint, finishing nails, scissors, etc. Have a general idea of how you will proceed, and then just have fun! I found it a little tough to get glue to stick to the shell of the pumpkin, but I had fairly good luck with Mod Podge and a hot glue gun. Small finishing nails were helpful: thumbtacks would work well also. This pumpkin would be an appropriate centerpiece any time throughout autumn. Cut four sections of glittery orange ribbon, long enough to run from the stem down to the bottom of the pumpkin. Glue each ribbon (I used Mod Podge) along a rib of the pumpkin. Secure the ribbons by pressing in finishing nails into the top and bottom of each one. Repeat the same process with the checkered ribbon, placing it in-between the orange glittery ones. Attach a few artificial flowers and leafs with a beige chenille stem (previously these were called pipe cleaners!) Tie a bow around the chenille stem with the checkered ribbon. Glue a fabric flower (star shaped) to the end of the stalk, then push a star fastener down through the center of it. I said I don't have a favorite, but she has sort of stolen my heart! She almost looks like one of the “Who's” from “Whoville”! The stem of this pumpkin was fairly tall, but really thick and blunt. I decided it would be a good place to glue some hair. The brown crinkly stuff is actually packing material that I had saved - thinking it would come in handy for something like this! Tie a ribbon around the base of the hairdo, and make a little bow. Attach “googly eyes” with a hot glue gun. Shape a red chenille stem into a mouth and attach with hot glue. You could add a nose - but she just didn't seem to need one! Such a cute little pumpkin girl! None of these pumpkins were hard to do, but this one took a little more time and skill with the glue gun then I anticipated! I had originally planned to paint a design on this one ... but then I spied my pack of long black chenille stems! Repeat the previous step with as many chenille stems as need to make a design covering the full pumpkin. Wrap the stalk with a chenille stem; coil the end, and glue it to the tip of the stalk. Here it is - the pumpkin that injured my son! I think the only advantage a carved pumpkin has over the ones above, is that you can illuminate it from the inside. We will put a candle inside my son's creation on Halloween night; to light up the darkness we also have our electric, artificial pumpkin decoration! We use this store-bought jack-o'-lantern every year! It is rare that we have any trick-or-treaters visit us. The houses in our neighborhood are just spread too far apart, and our driveway is too long and steep. If it could be visible from the road, I would have participated in the teal pumpkin project, and painted one of these pumpkins teal. I have stocked up on a few non-food treats - just in case a child with allergies appears at my door. I was quite surprised by how easy and how much fun these pumpkins were to make. Which of these pumpkins do you like best? Many dangers lurk during the Halloween season. We worry about tainted treats being passed out on Halloween. We worry about the risk of a child being hit by a vehicle while trick-or-treating. We worry that poor visibility, ill-fitting shoes, or draping fabric could cause a person in costume to trip. We worry that untended or poorly placed candles might cause a fire or burn someone. We worry that some Halloween themes and costumes could scare younger kids. We worry small children might choke on hard candy. We worry about stranger danger while our kids are out canvassing neighborhoods for treats. And I have always worried about the danger of someone being cut by a knife when carving a pumpkin. Pumpkins - waiting to be Jack - o'-lanterns! This evening my son left our house dressed like a cowboy (quickest costume he could assemble) and carrying his pocket knife, a sharp kitchen knife, and a pumpkin. A volunteer group he belongs to was having a pumpkin carving party. I said goodbye, and reminded him (as I always do) to be careful. "Don't cut yourself," I said, as he walked out the door. Had he been younger, I would have elaborated about the dangers of pumpkin carving. He is 17 now though, and as competent at cutting things with a knife as I am. I refrained from further comment - I'm working hard at trying not to over-mother! A couple of hours later, I was chatting on the phone with a far-away friend. The call-waiting beeped, and I ignored it. Minutes later, my husband burst into the room I was in. With unusual bluntness he said, “I need to talk to you - now.” I realized he was talking into his cell phone to my son. I quickly said goodbye to my friend. A vague thought flashed through my head. Something's wrong. Sure enough, my son's hand had slipped as he stabbed a hard section of his pumpkin, and his thumb had slid onto the blade. ... Lots of blood. ... Might need stitches. ... On his way to the Emergency Department. Wait - what? Is he driving himself?? By this point I was grabbing my keys and purse and made an unsuccessful attempt to quickly tidy up my hair. I was out the door within minutes of the call. We only live about 15 minutes from the Emergency Department. I probably got there quicker. By the time I arrived at the hospital, my son was already in an exam room, and had been assessed by the doctor. I thanked the group leader and my son's friend; who had driven my son and his car to the hospital and were waiting for me to arrive. I signed the paperwork, then found the room my son was in. He was calmly holding a bloody towel to his thumb, but pulled it back to let me see. A nasty, nasty gash -- but it could have been much worse. I'm sparing you the gory picture, and cropped the wound out of this photo! Almost immediately, the doctor was back in the room. My son didn't flinched when the lidocaine was injected and the doctor closed the wound with stitches. Fortunately, it was his non-dominant hand that had been injured, and only soft tissue had been cut. The doctor was confident that my son would heal quickly and soon be playing his guitar again. As the wound was being sutured, I sent my friend a text, to explain why I had so rudely ended our call. Before I did though, I saw that she had sent a photo to me, right after we hung up. Ironically, as she had no idea yet what had happened, it was of her son and his girlfriend - with a pumpkin they had carved! I sent her a photo of my son's cut (she is a nurse, so she could handle it!) and a quick text explaining the circumstances. She couldn't believe he had already been admitted and seen by a doctor, in the short period of time since we had spoken. Stitched, bandaged and ready to go. Just barely an hour after my son had called us, his thumb was sutured, a dressing was applied, and we were walking to our cars. One advantage to living in a small town is that sometimes the E.D. is not very busy! If only he hadn't decided to add a final touch to the lid of his pumpkin, my son's thumb would not be sore tonight! If you are planning to carve a pumpkin this year - just BEWARE! A special thanks to everyone who helped my son after he cut his thumb this evening! Have you ever been injured on Halloween? I have always encouraged my kids to keep their sports participation in perspective. "It's just a game" or "It's just a race" are phrases I have often uttered. This week, I am re-examining that philosophy. My husband and I have been soccer parents for 12 years. My son has been playing the "beautiful game" year-round for quite a few of those years, at many levels in various leagues. During his games, I've been a supportive fan - cheering, hoping my son's team would win, and mostly just praying (sometimes in vain) that my son and his friends wouldn't get hurt - and that they wouldn't hurt anyone else. I've even made a soccer cake for a birthday or two. But, this high school season I became a different fan. I suddenly became passionate about the outcome of the games. Runner-up the past two years, we were hungry for our kid's school to own the first place soccer trophy. Winning a championship was so important to our boys - and absolutely within our grasp. Or, so we thought this year. Going into the play-off game on Thursday, seeded second in our Division and playing the 7th place team, we still needed to win in play-offs to secure a berth at State. But, after overtime play and a shootout, we lost to a team we had won against twice before. Our boy's season ended - just like that. Totally unexpected. Why else would I have had a migraine for the first time on Thursday, after having been headache free for so many weeks? Why else would there now be people in the USA sick from the Ebola virus? Why else would there have been shootings in the parliament buildings of peace-loving Canada and in a school in Washington this week? Why else would the perfect season of our undefeated high school football team end, in a loss just hours after we lost our soccer game. The only explanation I can come up with for any of this is the recent eclipse. It apparently was nearly at its height about the time our opponent scored their first goal. While a local soccer game holds no significance on a global scale to major world events, perhaps the location of the moon did have an influence on them both? Scientifically, I know this is unlikely, but all of these events seem otherwise quite inexplicable. In this zoomed-in photo, the moon appears eclipsed by a prairie plant stem, but on Thursday, the moon eclipsed the sun. It was the culmination of a season. A season during which our boys changed from being individual players, to become a team. A season when their coaches changed, from seeing them not just as potential positions on the field, but as players with heart, stamina, courage and perseverance. During this season, these boys became like brothers. Their families became our family. This fall, we weathered the unfortunate occurrence of several nasty injuries together; all of us worrying about those boys like they were our own. Concussions. Various injuries of calves and hips and shins and other body parts. Badly broken bones, which required surgery. Through all this, positions on the field shifted, and determination deepened. One would think seeing and experiencing such severe injuries would instill caution in our players - they just played harder. There is a hole in our calendars. Players and fans have had the days of the MT State Soccer Tournament marked off for months. Suddenly, we will not be hosting or attending prestate tournament dinners. We can still go watch the games, and cheer on our school's outstanding girl's team - but school and work may take precedence over how much time we spend doing this. We are having to shift not just our mind-set, but our calendars. This feels a little heartbreaking, but it is really just an example of how plans in life can often change. It was the looks on our players faces, and the support they showed each other in the aftermath of the loss, that has me realizing what I had witnessed was more than "just a game." While it feels good to win a game and even a championship, true winners are not always determined that way. Our boys - our men - are all winners. They have all succeeded at other things (on and off the soccer pitch) before this game - and will do so many times again in the future. They may not have scored as many goals as the other team in the playoff game - but they have won at life. The score of a game is not always the measurement of a true win. I am sad for our boys. I am sad that when they expected to have more games to play, now the seniors will graduate and they will never all play together again. I am sad that their dreams of a championship have died. But, I have admired them - while they were winning, when they tied, and perhaps most of all, in this loss. It is my hope that with time, this team will gain perspective. Rather than blame each other, they are blaming themselves, shouldering the responsibility for why more points in this playoff game were scored against instead of for. I hope they realize that maybe it was just the fault of the moon. I hope they can shake off this loss, and understand that unlike unprecedented violence in a country which has always been remarkably civil, or a lack of containment of a deadly virus - whether you lose or win a soccer game, it is not really a life-changing event. There is a lot beyond athletic skill that can be learned and gained from sports. After the game, I texted my daughter (a college swimmer) and said, "I hate sports." Her astute response appeared immediately, "No, you hate these moments." She was right, as she so often is anymore. She has learned a lot through both success and disappointments in the pool. A competition is not really "just a game," it is a part of the game. One which everyone can win. I know that our boys, even though they will not compete for a state trophy next weekend, are true winners. Every single player. And I am proud of them. Very, very proud. Last night, I attended the latest Warren Miller film, No Turning Back. Have you ever seen a Warren Miller movie? A feature-length Warren Miller film has been produced every year since 1949. These movies are about extreme skiing and snowboarding, in some of the world's most beautiful snowy terrain. The skill level of the athletes in the movies is unparalleled. The filming of these mountainside activities is as stunning as the stunts are dangerous. As we watched the movie, the narration and music of the film was interrupted several times, as the audience oohed, cheered, and clapped in awe. I am not a risk-taker. The appeal of these adventures is hard for me to comprehend. Standing at the top of an insanely perpendicular, rugged mountain slope, with my skis as the the only option for descent, is not a place I would choose to be. My husband and son have skied down from the top of Lone Peak - I prefer to look up at it from part way down! A quote from a Warren Miller movie tells us, "If you don't do it this year, you'll be one year older when you do." I think that is good advice to apply to how I approach a lot of things. But, I'm pretty certain my future doesn't include imitating any of the skiers or snowboarders I saw last night. The rest of my weekend plans are pretty tame, by comparison. How about yours? Idioms are passed from one generation to another. They are phrases that we grow up with. Tidbits of advice, collapsed into a sentence which can be interpreted literally, but are usually meant metaphorically, with regards to a situation at hand. The covers on these books have seen better days, but the contents are still classic. Don’t judge a book by its cover. A worn out cliché, but it rang true for me today. This afternoon, I stopped at an auto-parts store to look for the jumper cables I had promised to purchase. These would be our donation for the “Car Care” basket my son's class was assembling for a Silent Auction at the School PTA Halloween Carnival. I wandered up and down the somewhat scruffy and cluttered aisles, feeling very out of my element. I was surrounded by men, all seemingly with a purpose and appearing comfortable locating what they needed. I perused every aisle, but couldn’t find the jumper cables. Seconds after he spoke to me, my eyes alighted on “just the thing” – an inexpensive “Emergency Car Kit,” complete with all sorts of emergency items, including the jumper cables I was needing to buy! When the salesperson returned to my side, I asked him if the contents of the kit were accurately depicted on the packaging, and told him why I needed it. I was very taken aback, and more than a little ashamed of myself. Somehow, I had placed this person in a stereotype, based on my observation of the disorganization of the shelves and dirt on the floor, and even (unforgivably) his gender. I had just assumed details of packaging and the aesthetic appearance of an item would have been unnoticeable and unimportant to the men managing and working in the store. Not only did this sales person find an impecable emergency car kit for me, he also voluntarily provided some store coupons, and a free t-shirt to add to the basket as well. Quite different from the cover, indeed. As I recall, the “car care” basket was a popular item at the auction. I'd like to think that my family’s contribution of jumper cables provided an increased feeling of security for the driver who acquired it. The awareness I experienced while purchasing them, however, was priceless. I recognized the absurdity of some unconscious stereotyping, while shopping for jumper cables. When was the last time you made an assumption about a person, but once you got to know them better, you realized it was not true? If you are a regular reader of my blog, you may have noticed that I did not publish anything yesterday. I have been busy making some changes to this blog, which I am writing about today. The layout and organization of this blog is constantly evolving. Look for more improvements in the future! Any guesses who I am dressed up to be? My blog changes worked - but I suspect there's an easier way! Even though I am the author of a blog about making the most of every moment, I confess I probably accomplish a lot of things the hard way! When it comes to blogging, I know this to be true. I've learned a lot through trial-and-error, but there is undoubtedly an easier and quicker way to do some of the web page set-up work that I have done! 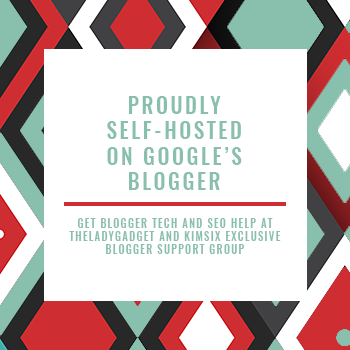 I am ever-so-grateful for the many tutorials specific to the Blogger platform that I studied before attempting the following changes myself. I'm not an expert on blog design, but it is my hope that by sharing here what I have learned, I might save another blogger a little time. Hopefully this new index will make my previously published posts easier for readers to find. This is what my new blog post index looks like so far. 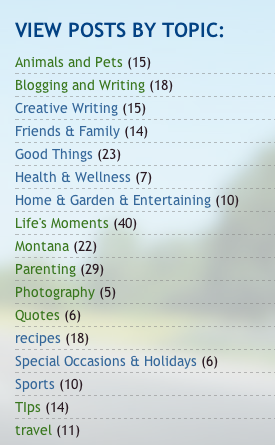 My advice to new bloggers would be to add some topic specific labels to each post as you create them ... trying to go back and add them to almost 200 posts has been a lot of work! Ideally, I would prefer to create an index of just linked thumbnail photos and titles , rather than the full blog posts under each topic - but I have not discovered how to do this yet on Blogger! The search bar on my blog looks like this! In an effort to make this blog more user friendly, I have been tweaking headings and rearranging things. I hope you like the changes! At first I had no clue what a blog button even is. In case you also wonder, these little squares are created to represent a blog, and then can be used on other sites to link back to a blog. A blogger "grabs" or copies the text in the box below an image, and pastes it (in html code format) where they want it. The image will (hopefully) appear, and when clicked upon, it should then link directly back to that blogger's site. I felt challenged to create one of these buttons -but it turned out to be more puzzling than I had hoped! I studied the advice of half a dozen websites, and then had to tweak the code some more myself. Mrs. Lindsey, at Teacher Blogging Basics provided some of the most clear instructions for creating a blog button that I was able to find. Her process seemed to work, except my “grab code” did not show up in the text box. A number of other people commented on her blog that they had the same problem - but my guess is that we were all doing the same thing wrong, or something has changed on Blogger since the tutorial was written! I kept playing with the code, and did some creative cut-and-paste until I seemed successful. I couldn't recreate the process now, even if I tried! I just hope it actually works! 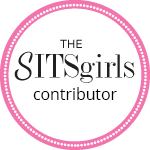 A photo of my blog button, as it appears on my blog. Is my blogging experience similar to yours? Has this been helpful, or do you have any good tips for me? If you grab my button - please let me know here if it works and is easy to use. What do you think of these changes to my blog? Your feedback means a lot to me. Please leave a comment with your thoughts! The exquisite wonders of our world can sometimes almost smack us in the face. Recently, this happened to me (literally). Here is the photo of what I saw. I didn't have to step into a museum to see this lovely piece. I do think, though, that it is very pretty and interesting enough to be considered museum quality. Reader's Digest magazine has done a series of articles where they invite the reader to look at a photograph twice. Initially, it is often unrecognizable for what it really is. When you turn over the page, another perspective of the scene or object is shown, making it clear what you have just been looking at. I didn't think to take another picture to put this photo in perspective, so I will just have to explain what you see here. What you are looking at is a photograph of the front window of my car - in an automatic car wash! Usually, I am a little claustrophobic as my car is rocking on its axles while being pummeled by sprays and brushes. Sometimes I even close my eyes and take a few deep breaths. The day I took this photo though, I was distracted by the beauty that appeared before my eyes. I love how this photo turned out. There are even three tiny hearts near the center of the picture - can you find them? Beauty is everywhere around us - even in the most unlikely settings. I'd love to hear about the most unusual source of beauty you see this week! As of this past Wednesday, I now have an Instagram account! I am hoping to get a little time this weekend to become comfortable with my latest venture into using Social Media. Twitter still sort of mystifies me - but maybe I will master Instagram more quickly. 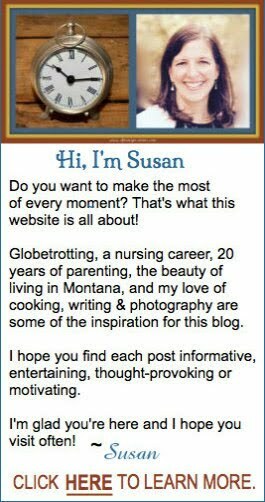 The Connect With Me Instagram button on my blog sidebar is now activated. It is the button that looks like this! I initially opened my Instagram account using my first name and one initial of my last name as my user name, but I just changed it so people who follow my blog can hopefully find me more easily there. My Instagram User Name is now Susan_ofeverymoment. I would really appreciate any of your suggestions for how to find the people I would want to follow, or tips about learning to use Instagram (or Twitter!). Feel free to share your Instagram name in the comments section below, so I can find and follow you. He's glad we are home now! Missed us, I think while we were in Kalispell! If you wonder why we were in Kalispell, that explanation was provided with the photo I posted there prior to this one! I look forward to sharing snapshots of my moments, and becoming a follower of yours. 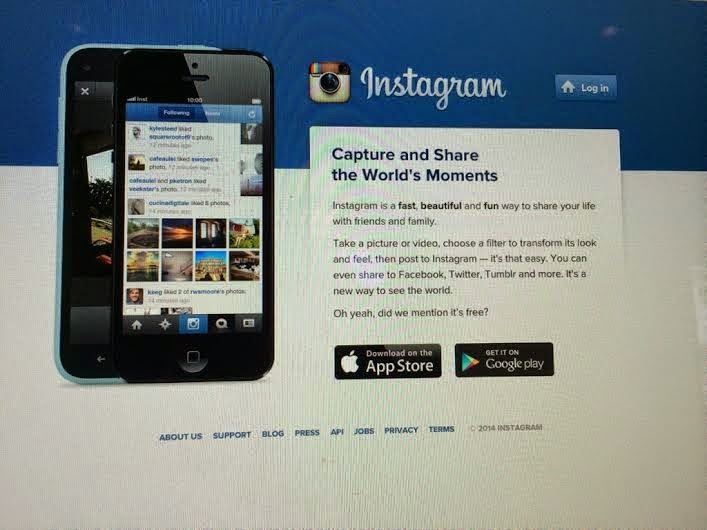 What suggestions do you have for using Instagram? Doesn't that just sum up a wonderful philosophy? I loved this saying so much I took this photo of it! I was reminded of that plaque yesterday, as I prepared a dessert for a soccer team-dinner. What to make for 18 hungry, athletic high school boys and their coaches? I wanted it to be something that could be easily grabbed and put on a plate; something the boys could take as many servings of as they wanted. I settled on brownies. My "Canoe Trip Banana-Butterscotch Brownies” recipe (which I published earlier on this blog) makes a huge pan and is always a hit, so I decided to make those. BUT - I feel like dessert should always include some chocolate! So I also made up two big pans of chocolate brownies. I used a recipe I had never tried, and it turned out to be a really decadent dessert. Good thing I did make the extra pans. Nearly all of both kinds of brownies were gobbled up - the few that were left may have just been because the boys were all too polite to take the last servings! If you are hosting a crowd, I would recommend making either - or both - of these recipes. The chocolate brownies I made were Hershey’s Ultimate Chocolate Brownies, a recipe I found in the Hershey cookbook I purchased when I lived in Hershey, Pennsylvania. The identical recipe is on the Hershey's Kitchen website, so you can find the full instructions here. Canoe-Trip Banana Butterscotch Brownies and Hershey's Ultimate Chocolate Brownies. GO TEAM! Good luck Boys! Would you eat chocolate any time of day?